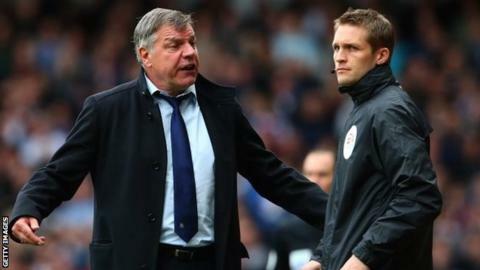 West Ham boss Sam Allardyce wants an academy for young referees after two contentious decisions in Liverpool's 2-1 win at Upton Park on Sunday. Hammers defender Guy Demel scored after Andy Carroll appeared to foul Liverpool goalkeeper Simon Mignolet. But Liverpool won the game with a penalty despite West Ham keeper Adrian getting a touch on the ball. "Get young referees off the parks and into academies. We don't have enough quality referees," Allardyce said. "They try their best but something has to be done about it. "We've been saying that something needs to be done for six or seven years. Hopefully one day they will take notice of us. "I'm talking about the recruitment and development of referees, and their environment. "Get them off the parks and into academies of young referees. Our next level should be professional assistant referees. It would improve communication." Both managers were left talking about decisions by referee Anthony Taylor as Liverpool returned to the top of the Premier League. Steven Gerrard put Brendan Rodgers' side ahead from the penalty spot after James Tomkins handled, but the hosts were level before the break when Demel stabbed in. Linesman Stuart Burt had flagged for a foul by Carroll as he challenged Mignolet, but after consulting his assistant, Taylor awarded the goal. And it was the Hammers' turn to feel aggrieved when Gerrard converted a second penalty, given by Taylor after Jon Flanagan went down under Adrian's challenge. Allardyce said: "Unfortunately we are talking about the officials and not the game. "The referee made big mistakes in the game. The second penalty was not a penalty, Adrian plays the ball. "It looked like Andy Carroll fouled the goalkeeper for our goal but we got it. We don't want that, nobody wants that. "My real concern is that we are talking about referees every week. It's always controversy, frustration, aggravation for the players. "The officiating was not up to the level we play at." Liverpool manager Rodgers, unsurprisingly, felt that the award of the match-winning penalty was the correct decision as his side moved two points clear of Chelsea. He said: "When you play against West Ham the referees get called to make more decisions because of the nature of their style. The officials are asked a lot of questions. "It was clearly not a goal for West Ham and I thought the referee was chasing the game after that. "Andy Carroll is the best in the air in Europe but it was a foul by him for the goal. The linesman gave a foul so it was disappointing to get a goal given. "The second penalty was a penalty. Jon Flanagan touches it past the keeper, the keeper gets a slight touch on it but he then brings down Jon."